West Ham will head to Andorra for their Europa League first qualifying round tie against Lusitans with co-chairman David Gold hoping it is the first leg of a long journey to reach the Champions League. The Irons returned early to pre-season training on Monday at the club's Chadwell Heath complex, just 28 days after the final Barclays Premier League match. New boss Slaven Bilic, who earlier this month was appointed as replacement for Sam Allardyce, will need to get the squad in shape quickly ahead of the first leg against the Andorrans. West Ham - granted a European place via the UEFA Fair Play table - are provisionally scheduled to travel to the 1,000-capacity Camp d'Esports d'Aixoval on July 2 before the return leg at the Boleyn Ground a week later. However, those fixtures could yet be reversed because of Andorra's other side Sant Julia also being drawn at home. Furthermore, UEFA ground regulations could mean West Ham's away leg is switched to the national stadium. Were the Irons to come through the tie, they can then look forward to a second qualifying round meeting with either Birkirkara of Malta or Armenian outfit Ulisses later in July. Gold sees no reason why West Ham should not head into their European adventure with some confidence. 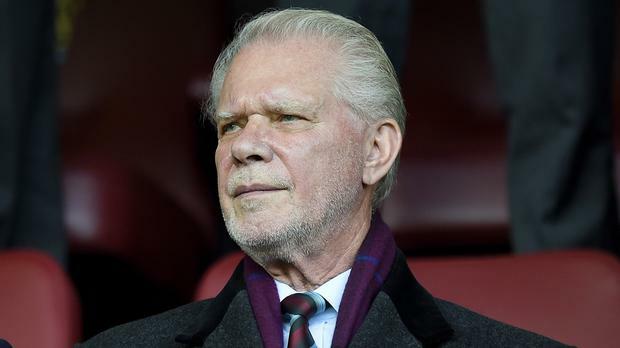 "This is our entry into Europe and is the beginning of a long journey, but an exciting one at the same time," Gold said on the club's official website, www.whufc.com. "We know the rewards for winning the competition is a place in the Champions League and that is the ultimate dream. "I know some of the players have returned for the start of pre-season training and there is a great deal of excitement around the squad. "This is the beginning of a new adventure and there is a really good feel around the place. "We have already signed Darren Randolph and Pedro Obiang and we are working hard behind the scenes to try and strengthen the squad." In the qualifying rounds of the Europa League, there were some 102 teams in the pots for Monday's draws in Nyon. Shamrock Rovers will play Luxembourg's Progres Niedercorn while Linfield tackle NSI Runavik of the Faroe Islands. Runavik manager Trygvi Mortensen said: " We are well satisfied with the draw. Linfield was the team we wanted most. "We have seen them a few times in the Faroe Islands and they have never been frightening, although they have progressed every time. "We are not going to sit back and defend against them." Saint Patrick's Athletic meet Skonto FC of Latvia and Northern Ireland's Glentoran face Slovak side MSK Zilina. Glenavon play Shakhtyor Soligorsk of Belarus, Cork City will be against KR Reykjavik of Iceland and University College Dublin face F91 Dudelange of Luxembourg. AUK Broughton meet Lokomotiva Zagreb and Bala Town will face FC Differdange 03 of Luxembourg while Newtown AFC were paired with Maltese side Valletta. Southampton, who finished seventh in the Premier League, will enter the Europa League at the third qualifying round. Liverpool and Tottenham will go directly into the group stages. In the Champions League qualifiers, Irish club Dundalk were handed a tough test against BATE Borisov, the champions of Belarus. In the first qualifying round, The New Saints of Wales, one of the seeded teams, will play B36 Torshavn of the Faroe Islands while Northern Irish side Crusaders were drawn against Estonian side Levadia Talinn. Brendan Fanning Munster suffered another semi-final defeat in Europe - their sixth on the bounce starting with the defeat by Leinster in 2009 - when they were well beaten (32-16) by Saracens in brilliant sunshine at Coventry's Ricoh Arena yesterday. By Press Association Sport staff Arsenal boss Unai Emery has hailed Crystal Palace academy graduates Wilfried Zaha and Aaron Wan-Bissaka and insists he has plenty of his own young players pushing for a place in his squad.